Moo, moo!! Milk a cow, produce some milk! You are a dairyman, milking fresh milk everyday, working hard to fulfill the orders given by the farm owner. But be aware! If your milk spoils an entire day's work will go down the drain! Or maybe you can turn milk into cheese or ice cream products, increasing their value and prevent them from spoiling! 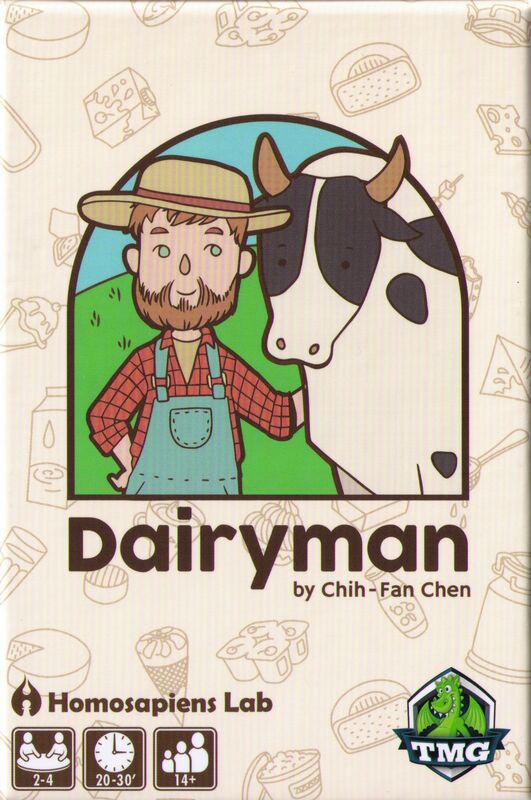 Can you become the best dairyman of the farm? In clockwise order, players take turns to roll all dice, and must lock one set of dice that have a sum of exactly 10. They may repeat this process until they want to pass. They may then trade their dice of 10s for milk tile(s) of equal value. If they fail to roll a sum of 10, their turn ends immediately and they will get a snow token as a compensation, which may be used to flip the milk tiles later in the game to earn extra points or gain special abilities. When the stack of milk tiles is depleted, the player with the most points on their milk tiles wins the game.